It was a historic moment for creators. 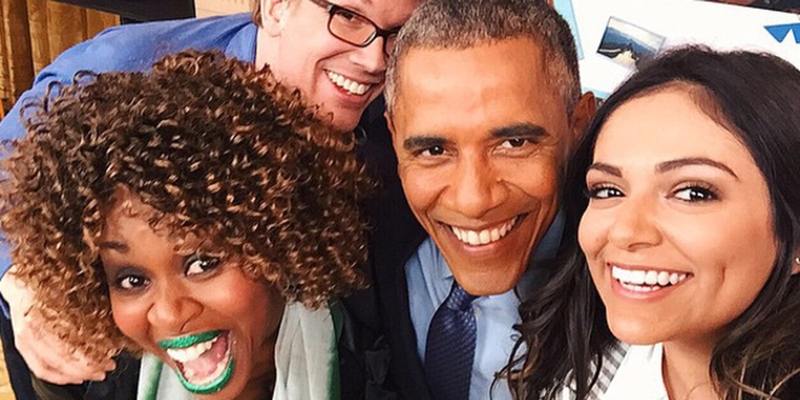 Yesterday, three popular YouTube stars got a chance to interview President Obama as part of the #YouTubeAsksObama event. Hank Green, Bethany Mota, and GloZell Green all sat down post-State of the Union address and asked solid questions. This apparently surprised a lot of mainstream media outlets that had no idea who these creators were or why they would get to interview the president. Author John Green, Hank’s brother, pointed out the irony. Love how the media is talking about the “surprise” quality and seriousness of #YouTubeAsksObama, and then reporting on football deflation. The coverage leading up to the event was embarrassing, but it really showed the divide between new media and old. Fox News couldn’t believe how “bizarre” this interview concept was. The language used to describe Mota and GloZell in particular was interesting. Outlets diminished GloZell’s accomplishments by zeroing in on her 2012 cereal challenge. Elsewhere on social media, their qualifications were called into question, their selfies highlighted. Beneath the dignity of the Office? Of course. This YouTube-Obama angle isn’t new; the White House has actively tried to elevate major YouTube stars like Tyler Oakley in its attempt to reach younger people and change the conversation on issues like healthcare. Oakley interviewed Michelle Obama last year, and while many people have no idea who he is or why he’s popular, the generation raised on YouTube does, and they’re an increasingly influential mass, one mainstream media should be embracing if they want to stay the least bit relevant. More importantly, these creators were asking questions mainstream media won’t. Score one for #TeamInternet.